Advancements in dentistry has allowed us to get many options when it comes to improving the condition of our teeth. Nowadays, one can opt to get veneers, crowns, metal braces, and even braces that are removable, and barely noticeable. Individuals who had orthodontic treatments decades ago now say that over the years, their teeth that were corrected in the past has now shifted to a new position. And that instead of having a correct bite, they are now experiencing difficulties with their teeth. Dentists who have been giving orthodontic treatments say that it maybe because their teeth have relapsed. Experienced orthodontists say that a lot of the past generations had orthodontic treatments when they were young. But because they did not wear retainers, their teeth shifted over the years. They also say that many of those who belonged to this generation really want to have good looking teeth even as they grow older. Today, the AAO, or the American Association of Orthodontists say that as much as a third of the entire American adults are not happy with their smiles. As much as 4 million adults are getting orthodontic treatments, and there are a lot of parents today who want their kids to get braces by the time they reach 10 years of age. This is simply because they do not want their children to suffer from the stigma of having unattractive teeth. We all know that the teeth are one of the first things that we notice when meeting other people, this is why we want our teeth to be fixed in the soonest time possible. Crowded or misaligned teeth are also harder to clean, making them more susceptible to oral problems. As mentioned, there are now new options that you can avail of when it comes to improving your teeth. It is now fairly easy to get traditional metal braces, and if the budget allows, you can even opt to get invisalign braces, crowns, or veneers to help fix your teeth. As a matter of fact, there are a lot of orthodontists who say that because there are so many ways for people to get a beautiful smile, most of their patients just come to their clinics in order to get the latest innovations when it comes to braces. In the past 15 years, orthodontists say that there has been an increase in demand for invisalign braces. A lot of adults are getting braces, but because Invisalign can hardly be seen on the outside, and because it is removable for easy eating and cleaning, a lot of people prefer to have it rather than the other types of braces. Individuals who have chosen invisalign say that they are very happy with the results. In most cases, it only took 10 months to see drastic changes in their teeth. Most patients will pay $2,500 of their own money for the procedure, with their insurance covering as much as $2,000. Those who did not opt for Invisalign braces got self-ligating braces instead. Unlike Invisalign, they are not removable. 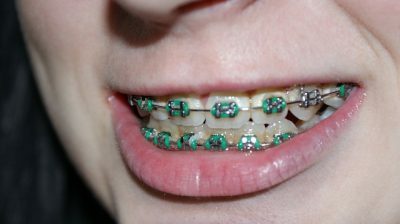 They are however, less visible than metal braces because they are smaller, and because they use clear or ceramic parts. Ceramic braces are not that visible when bonded to the teeth because its brackets are made from tooth-colored materials. Most parents still opt for metal braces when it comes to helping their kids get straight teeth. Experienced orthodontist agree with them by saying that today, metal braces are still the standard when it comes to moving teeth to their proper position. In most cases, the entire treatment will cost around $2,700 and it will take around 16 months to finish. However, it is very important to keep in mind that braces are just the beginning when it comes to getting a great smile. Because the teeth continue to move and change over time, it is necessary to wear retainers after. Experts say that if you want to maintain the improvement that you got from wearing braces, you need to follow the doctor’s advice carefully. Some patients need to wear retainers for up to 12 hours per day, for at least a year, while some need to wear retainers for several years. If you do not yet know what the best treatment is for your own needs or for your children, you might want to talk to your dental provider first. Ask about the different options and know their advantages and disadvantages. It is also important for you to know the costs. On average, traditional braces can cost as much as $4,000, self-ligating braces can cost as much as $5,000, and clear ceramic braces can range from a few thousand dollars to $8,000. Depending on the plan, your insurance might also cover some of these costs. Orthodontists recommend that you start getting checkups by the age of seven, this will allow your dentist to use interceptive strategies that can help your teeth and jaw to align properly. Whenever you want to get braces, it is very important to get in touch with a dental expert. You need to look for experienced orthodontists simply because they are the ones who specialize in straightening teeth and fixing jaw alignment. They are the ones who are qualified to provide you with braces and retainers simply because they are the dentists who completed years of specialized schooling for these procedures. As a matter of fact, even general dentists will refer patients to specialists when it comes to doing difficult procedures. General dentists however, can opt for additional training if they want to be able to do complex techniques. For those who want cosmetic dental procedures on the other hand, the American Dental Association recommends that you go to a prosthodontist so you can get veneers or crowns that can help improve your smile. Prosthodontists can help you get a dramatic change when it comes to the way your teeth looks, they can use veneers and crowns to create a permanent change with regards to your teeth’s color, shape, and size. Although a general dentist might be able to do it, it might be best if you let a periodontist take on the job for you. Most experts say that patients can easily choose the right dental provider by doing their research and by examining a provider’s background and credential before getting a consultation. You should also consider choosing a dentist based on his or her experience and specialization. As a matter of fact, there are patients who are ashamed to show their smile simply because they have a gap in their front teeth. But by going to the proper dental specialist, they can now smile confidently after having it fixed. Even if they did spend a couple thousand dollars entirely out of pocket, they say that the results are all worth it. If you are looking for something cheaper, you can ask your dentist to do bonding procedures to help fill the space in between teeth. This option will typically cost a few hundred dollars. You can also opt to get implants, but they are more expensive, and they are typically used to replace extracted or lost teeth. When getting implants, you will need to go through several steps which includes surgery. The entire process will be finished within several months and the costs can be as high as $4,500.